Avocado toast is not only popular on Instagram these days but it is also a popular healthy breakfast! So if you are already curious how those colorful plates on Instagram are made… stay tuned! we are going to share the best avocado toast dish with you. 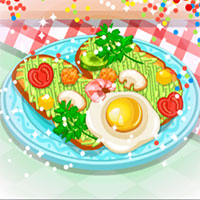 Begin by preparing the star ingredient of the dish: wash the avocado fruit, open it and mash it in a bowl until creamy. Toast the bread and then use a knife to spread the avocado paste over it.